Three buddies set up a business tackling paranormal phenomena. The eager public uptake of DVD quickly offered the studios their first completely new opportunity to re-work their catalogues since they discovered that people might be interested in owning copies of their favourite movies. Ghostbusters is a good example of how a title has been released over and over again on, and how it has been given a new lease of life by being released on a new format. In the UK the film was an enormous theatrical hit; it did very well on rental and sell-through video and it was very popular whenever it turned up on TV. But, perhaps inevitably, it ran out of steam early in the 90s, when anyone who wanted to see it had done so. The eventual release of a widescreen version (on laserdisc and on VHS) sated the cravings of the film’s more dedicated fans, and enabled the studio to squeeze a bit more revenue out of a movie that had been a big hit a decade earlier. The arrival of a DVD version has offered customers an array of features to tempt them to upgrade from VHS. If Ghostbusters’ top-quality digitally re-mastered widescreen 16:9-enhanced transfer with Dolby Digital 5.1 sound isn’t enough to convert the Luddites, then the disc’s constellation of extra goodies must surely do so. The film, a comedy about three friends who set up a business investigating paranormal phenomena just before a tidal wave of ghostly activity hits Manhattan, looks wonderful, making previous transfers (including the aging Criterion laserdisc) seem positively archaic. The new sound mix lacks the full dynamic range of a modern blockbuster, but enhances the film considerably. The disc’s bonus features, which provide a comprehensive overview of how the film was created, are accessed through a terrific computer-animated menu system. 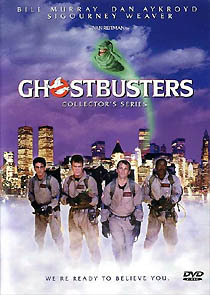 There is a running commentary, which is presented with optional Mystery Science Theatre 3000-style superimposed silhouettes of contributors Harold Ramis, (who wrote, as well as starring), Ivan Reitman and producer Joe Medjuck: a nice – if rather pointless – touch that rather sets the tone for the other bonus materials. Dan Aykroyd and female lead Sigourney Weaver are both well represented on a short, but satisfying, new “making of…” documentary, but Bill Murray is conspicuous by his absence. A contemporary behind-the-scenes featurette is also presented, which contains some relatively coarse-looking on-set footage. Another documentary features members of Richard Edlund’s special effects crew, supported by hundreds of photo’s, storyboards and pieces of production design artwork. Ten scenes deleted from the final cut are a highlight, (although it’s obvious that all of them were sensibly excised), including a bizarre scene featuring Aykroyd and Murray as hobos in Central Park. The disc has a couple of other innovative tricks up its sleeve. There’s the option of having production notes presented like subtitles as the movie unspools, providing a buff with a treasure trove of trivia and anecdotal information. Another feature uses the format's “alternate angle” function, allowing the viewer to toggle between two or more different views of a scene. Here it’s used during two sequences to enable the viewer to compare raw footage before the special effects were added with the same scene from the finished movie. Some early players may struggle to utilise this feature. Finally, owners of DVD ROM drives will also be able to access the film’s shooting script, (and jump from it to the relevant scene in the movie), cast and crew filmographies, etc. It took Columbia’s UK division four months to release Ghostbusters in Region 1, probably because they were very busy snipping away at the extra features to bring unlucky UK DVD buyers a distinctly second-rate version of the American disc. There are many omissions, but two items alone make it worth getting the Region 1 disc over the Region 2 disc: the “Tricks and Trivia” subtitles that appear as the film unspools and the especially-shot ten-minute 1999 Featurette, which featured contemporary behind-the-scenes footage alongside brand new comments from cast and crew members. No doubt a lot of this material had to be ditched to allow subtitles in fifteen different languages, and a German soundtrack, none of which is much use to a British audience, but which no saves Columbia a few quid in pressing different versions for different territories. Once again it’s the consumer – and specifically the British consumer – that suffers. The Region 1 DVD features especially created new cover artwork, and comes on a nice polka-dot effect colour picture disc. 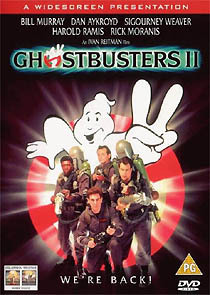 The Region 2 disc features the same ol’ Ghostbusters logo’ cover, and a plain black-on-silver disc. Both discs contain the same 16:9-enhanced, Dolby 5.1 version of the film, and both look and sound superb. If only Columbia had put a fraction of the effort they expended on the Ghostbusters disc into creating a special edition Ghostbusters II disc! Instead the Region 2 DVD is conspicuously bare: there’s a trailer (which is also on the Ghostbusters disc), and that’s it. The film is given a new widescreen (2.35:1) 16:9-enhanced transfer, with Dolby 5.1 sound, which marks a big improvement, even over the letterboxed PAL laserdisc.